I've often written about how I pay attention to airline safety demonstrations and how important it is to listen to them each and every time before take off. But when I do listen and they come to the part about "the inflatable slides can be used as rafts" and "there are additional rafts in the ceiling," or "your seat cushion can be used as a flotation device" I do find my interior monologue thinking, "Really? What are the chances of a water landing? And if there is one, what are the chances we'll survive to use them?" With the recent release of Warner Bros.' "Sully," recounting Captain Chesley "Sully" Sullenberger's heroic water landing of US Airways Flight 1549 on the Hudson River, in which everyone did indeed survive despite the fact that most people probably didn't listen to the safety video and most deplaned without their life vests (perhaps because they had no idea there were life vests, or, if they did had no idea where they were located), it's time to note that Flight 1549 isn't the only water landing where everyone (or most people) survived unharmed. It wasn't even the only river landing in which all passengers and crew got out alive. In 1963, an Aeroflot jet with 45 passengers and seven crew on board ditched in Leningrad's Neva River, after a landing gear malfunction and bad piloting resulted in the Tupolev Tu-124 running out of fuel. In fact, water landings of a different kind used to happen all the time. Pan American's Flying Boat routes, flown by aircraft such as the Sikorsky S-42 and the Martin M-130, were designed to land on water, as their name suggests, and did so without incident countless of times in the 1930's. On March 26, 1955, a Boeing 377 Stratocruiser with 18 passengers and five crew, en route from Portland, OR to Honolulu, was about 35 miles off the Oregon coast when an engine tore loose from the wing, causing loss of control and resulting in the pilot ditching the plane in the Pacific. The plane floated for enough time for a Navy vessel to reach the plane and rescue all but four of the souls on board. After two of its four engines failed over the Pacific Ocean on October 16, 1956, this Boeing 377 Stratocruiser also ditched. All 24 passengers and 7 crew survived after boarding three life rafts and were quickly rescued by a U.S. Coast Guard ship. Forty-four cases of live canaries in the cargo hold were lost at sea, however. The incident became the subject of the movie "Crash Landing" (1958), which starred Nancy Reagan, who played the pilot's wife. Speaking of movies, you can even watch Flight 6 landing thanks to a U.S. Coast Guard film available on You Tube. In October, 1962, off of Sitka, Alaska, all 95 passengers and seven crew survived without major injuries when a DC-7 propeller plane, on a charter flight carrying members of the military and their dependents, was forced to water land as a result of engine failure. The aircraft stayed afloat for 25 minutes, long enough for passengers to scramble onto life rafts and await rescue. Then there are the "landings" that ended up in the water at the end of runways because of pilot error or other malfunctions. These aren't exactly ditchings, but show why airplanes carry life jackets, inflatable rafts and other "flotation devices". Pilot error caused this Douglas DC-8 jet to land 2.5 miles short of the runway on a flight from Tokyo to San Francisco on November 22, 1968, ending up in San Francisco Bay. Amazingly, the plane was not severely damaged and even more bizarrely was refurbished by United Airlines and returned to service on JAL a year later. None of the 96 passengers and eleven crew was injured. Captain Sully's flight wasn't the first time a US Air plane ended in the drink upon departure from Laguardia Airport. On September 20, 1989, a US Air 737-400 carrying 57 passengers and six crew ended up in the East River soon after takeoff. 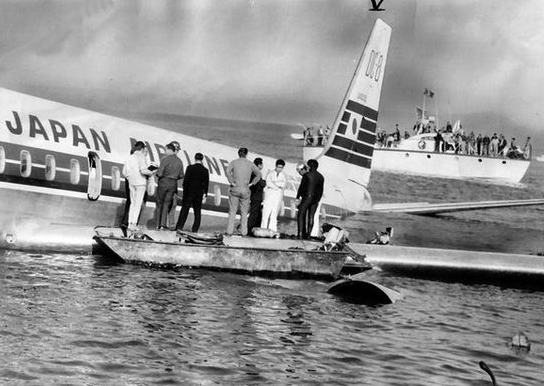 Two people died, of asphyxia, oddly, rather than drowning, and two were critically injured; the aircraft was not equipped for extended over water operation and only seat cushions were provided for flotation, which the government accident report noted are "inadequate substitutes for life preservers, especially for infants, handicapped persons, and other injured persons." (Even today, some planes, such as an American Airlines Embraer I flew on recently from San Jose to Los Angeles, only have seat cushions rather than life vests.) By the way, these pilots were no heroes. Both were stripped of their flying licenses for going AWOL for over 36 hours after the accident, negating the opportunity for timely drug and alcohol testing. This November 1993 incident was also a runway overshoot that landed in the water. Even so, there was time for cabin crew to make sure passengers put on their life jackets, and, although the Boeing 747-400 eventually sank, the passenger cabin remained above water long enough for the 374 passengers to escape unharmed using those inflatable slide rafts that I have so often wondered about.